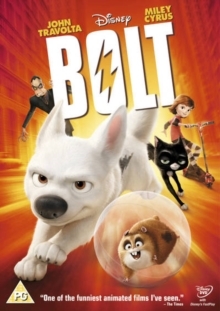 Feelgood Disney animation following the adventures of Bolt, canine star of a Hollywood TV show, who has to find his way home after accidentally getting lost. Having never left the sanctuary of his studio set, action TV star and German Shepherd, Bolt (voice of John Travolta), actually believes he possesses the superpowers of his show's fictional character. He receives a rude awakening when, after being accidentally shipped from Hollywood to New York, he has to figure out a way to get home. Teaming up with some new friends - a seen-it-all-before alley cat called Mittens (voice of Susie Essman), and fat hamster Rhino (voice of Mark Walton), who's encased in a plastic ball, dog-out-of-water Bolt sets off on his cross-country journey to rejoin his owner Penny (voice of Miley Cyrus).